Hurricane Harvey Continues Path Through Texas : The Two-Way The storm made landfall as a Category 4 storm late Friday, becoming the strongest hurricane to hit the U.S. in a dozen years. More than 200,000 people were without power early Saturday. 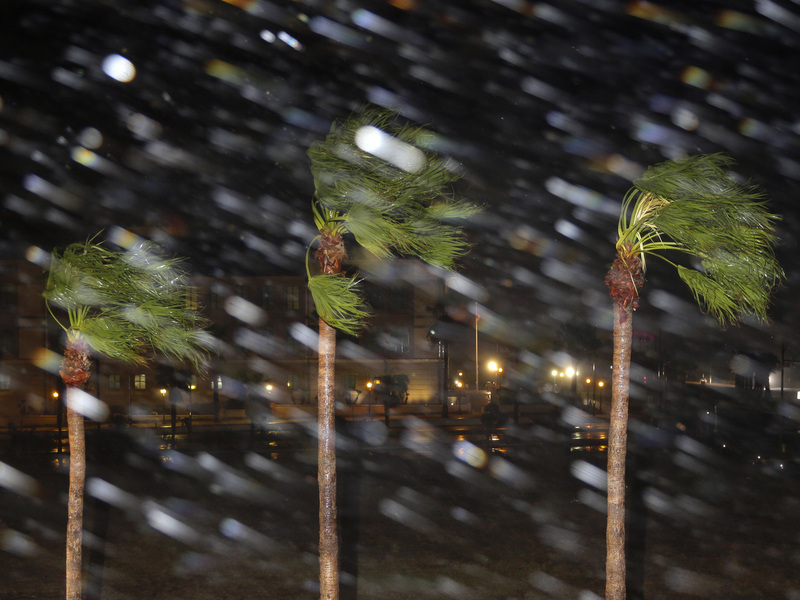 Rain is blown past palm trees as Hurricane Harvey makes landfall Friday in Corpus Christi, Texas. Harvey steered into the Texas coast with the potential for up to 3 feet of rain, 125 mph winds and 12-foot storm surges. More than 211,000 people were without power along the Gulf Coast of Texas early Saturday as Hurricane Harvey slowly made its way inland. "Harvey is expected to slow down through the day and meander over southeastern Texas through the middle of next week," the National Hurricane Center reported at 4 a.m. Central time. The center warned of "catastrophic flooding" over the next few days from heavy rainfall and said parts of southeast Texas have reported 10 inches of rain. Winds had earlier reached 130 mph but maximum sustained winds had now decreased to 100 mph, the NHC said. "Additional weakening is forecast, and Harvey is likely to become a tropical storm later today," forecasters said. The eye of the storm at 4 a.m. Central time was about 30 miles southwest of Victoria, Texas, and traveling northwest at 6 mph. 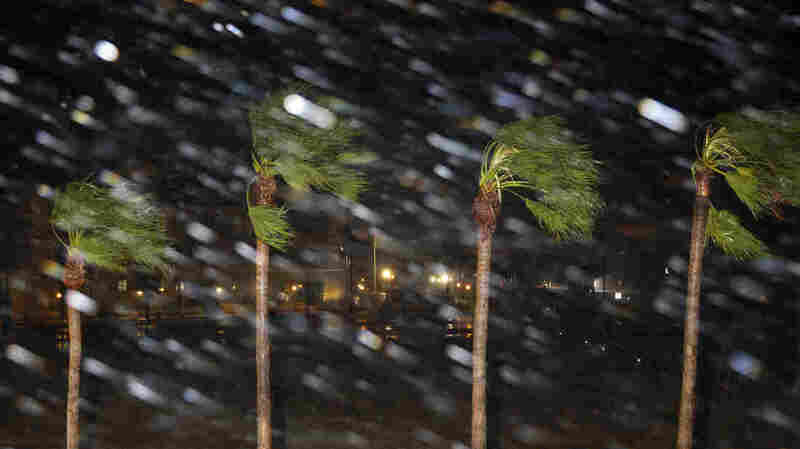 The Associated Press reported that the town of Rockport, Texas, had suffered major damage from the storm. Rockport's mayor told the AP there was severe damage to the town's courthouse, with a cargo trailer embedded halfway inside the building. An early report that a Rockport high school collapsed turned out to be significant but not catastrophic damage, according a Corpus Christi Caller-Times reporter. According to the NHC website, the eye of Hurricane Harvey first made landfall between Port Aransas and Port O'Connor, Texas. It warns of some locales getting as much as 40 inches of rain through the middle of next week. Victoria, just north of landfall, picked up an inch of rain in just over an hour late Friday. Harvey is the first major hurricane to hit the U.S. in a dozen years according to the National Hurricane Center. There were reports of extensive damage in Corpus Christi. The Washington Post reported "numerous structure destroyed" and "buildings collapsed with people inside." As of 1 a.m., electrical grid manager ERCOT was reporting about 211,000 customers without electricity in the region. Earlier in the day Texas Gov Greg Abbott told residents in the areas between Corpus Christi and Houston to "strongly consider evacuating," according to member station KUT. "Put your life first and your property second." Abbott said Hurricane Harvey was going to prove "more dangerous than many hurricanes." Abbott declared a pre-emptive state of emergency in 30 counties encompassing the entire coast in an effort to speed up deployment of resources to the affected areas. He appeared to avoid criticizing local officials who haven't yet issued mandatory evacuation orders. For example, Houston Mayor Sylvester Turner tweeted, "please think twice before trying to leave Houston en masse." And Francisco Sanchez, the spokesman for Houston's Harris County emergency operations, tweeted: "LOCAL LEADERS KNOW BEST." Abbott also requested a disaster proclamation from President Trump, which the president signed late on Friday. According to the NHC, with a Category 4 storm: "Catastrophic damage will occur: Well-built framed homes can sustain severe damage with loss of most of the roof structure and/or some exterior walls. Most trees will be snapped or uprooted and power poles downed. Fallen trees and power poles will isolate residential areas. Power outages will last weeks to possibly months. Most of the area will be uninhabitable for weeks or months." By Friday evening, Harvey carried maximum sustained winds of 130 mph, according to an NHC Update. 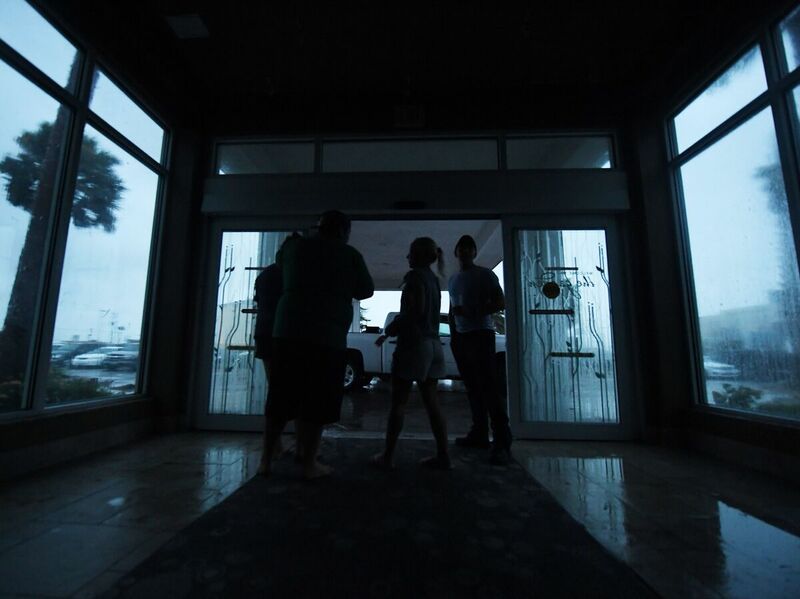 Corpus Christi, Texas, residents watch the Hurricane Harvey in the dark after a citywide power failure Friday. However, Dave Roberts, a hurricane specialist with the NHC in Florida, tells NPR that "as it moves close to the coast later tonight and early Saturday, we should have landfall about that time and as it starts to move further inland, we should see the system begin to slow in forward motion and meander." When Harvey stalls out, as forecast, it could dump up to 3 feet of rain in some parts of Texas, coupled with up a storm surge of up to 12 feet. The Hurricane Center has issued a storm surge warning for a more-than-400-mile stretch of coastline from Port Mansfield to High Island. KUT reports that coastal residents are bracing for rain totals forecast to be "10 to 20 inches east of I-35 and totals as high as 25 inches in areas south of I-10 through Tuesday." Three airlines — American, United, and Southwest — have canceled all flights in and out of Corpus Christi International Airport through the weekend. Several others are rebooking flights for travelers in Austin, Houston and San Antonio. Carnival Corp. said that three of its cruise ships will not return to the Port of Galveston, Texas, as scheduled. Carnival Freedom and Carnival Valor are headed for New Orleans. A third, the Carnival Breeze, will stay in Cozumel, Mexico, according to a company spokeswoman. Evacuation orders have been issued for several counties north of Corpus Christi, nearest the area where the hurricane is expected to make landfall. The cities of Portland, Rockport, Port Aransas, Aransas Pass, Ingleside and Robstown have also been ordered to evacuate, as well as all residents of Brazoria County who live on the Gulf side of the Intracoastal Canal, according to The Weather Channel. Galveston County's Daily News reports that the West End of Galveston Island, Jamaica Beach, the Bolivar Peninsula and the city of Dickinson are under a voluntary evacuation. In an interview with ABC News' Good Morning America, Federal Emergency Management Agency Administrator Brock Long expressed fear "that people may not be taking this storm seriously." "That window to evacuate is coming to a close," Long said. Video of Hurricane Harvey taken from the International Space Station. White House press secretary Sarah Huckabee Sanders said Friday that President Trump may travel to Texas early next week. Harvey rapidly moved up the Saffir-Simpson scale beginning Thursday, strengthening from a tropical depression to a Category 1 hurricane. By early Friday, its winds had reached 110 mph, placing it at the top end of Category 2 status, and by the afternoon, it was a Category 3 before increasing in strength even more. "We're forecasting continuing intensification right up until landfall," National Hurricane Center spokesman Dennis Feltgen was quoted by The Associated Press as saying. In Houston, Jeff Lindner of the Harris County Flood Control District said Harvey could prove to be a "historic rainfall event." "We are hurricane-tested here in this state. This is going to be different," Lindner was quoted by Houston Public Media as saying. "This is going to be a hurricane that comes in strong to the mid-Texas coast, and then we're still dealing with it next Monday and Tuesday." 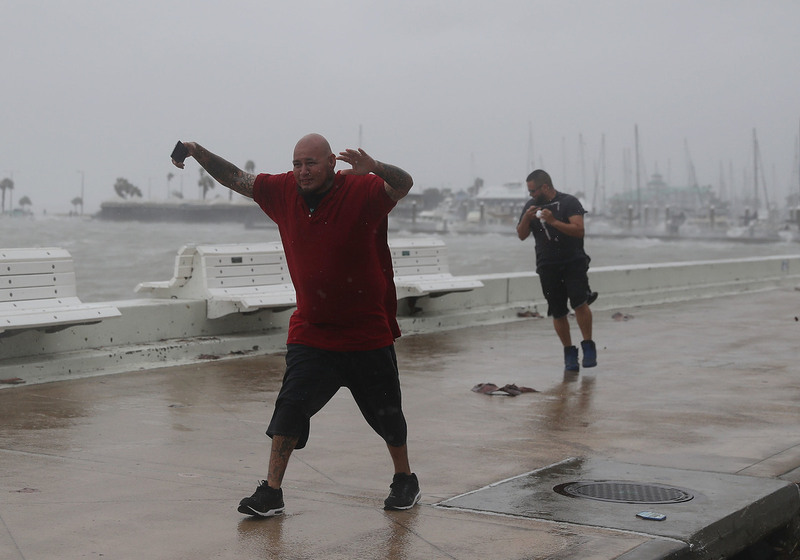 Raul Barral (left) and Carlos Guerra walk through high wind and driving rain in Corpus Christi, Texas, Tuesday as Hurricane Harvey approaches the Gulf Coast. The NHC warns that the deepest water will occur on the coast closest to and northeast of the area of landfall. The last Category 3 or higher storm to hit the U.S. was Wilma, which smashed into Florida's coast in 2005, causing an estimated $30 billion in damage. It was the same year as Katrina and Rita, a record-breaking hurricane season that included three of the seven most intense Atlantic hurricanes on record. Hurricane Bret in 1999 is the only major storm to have hit the Texas coast in the past 47 years. One of the most deadly storms was Ike, which killed nearly 200 people after it made landfall as a Category 2 storm near Galveston in 2008. Ike also ranks as the third-costliest Atlantic hurricane on record, after Katrina and Sandy. NPR's James Doubek and Christopher Dean Hopkins contributed to this report.